Like most industries, the specialty food business is obsessed with trends. Specialty foods stores are eager to stock the most innovative brands of popcorn and pasta as a competitive advantage over conventional food stores. I attended the 2015 Summer Fancy Food Show last month as a way to keep up with the latest food trends from around the country. Run by the Specialty Food Association, this year’s summer show attracted 2500 exhibitors displaying more than 180,000 products. What’s coming down the pike? 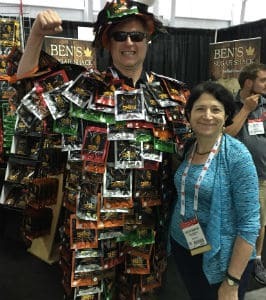 More energy bars than I have the energy to list, tea-flavored products, a great deal of things made with ginger and turmeric, ancient grains galore, popcorn popping up all over, and some crazy good food from the southeastern U.S. If you can’t go to the show, you can go online to check out the “sofis,” the Academy Awards of the specialty food industry. Many of the winners and finalists are in tried and true categories, like cookies, condiments, and caramels, but they manage to make their products stand out because they have gorgeous packaging, combine unusual ingredients (Sicilian Pistachio and Extra Virgin Olive Oil Spread, anyone? ), or feature less common ethnic flavors, such as the new Kitchens of Africa line of sauces. Of course, you don’t have to go to national shows to see innovative products. Mass Innovation Nights in Boston, the Pioneer Valley, and New Hampshire are monthly showcases for the latest food and technology products and services. Slow Money in Boston, Maine, and many other locations, encourages people to invest in farms, food, and technology to help rebuild local food systems; they hold showcases and gatherings that are a great place to see innovative entrepreneurs. I learned about some of coolest products at local events and then saw them later at the Fancy Food Show. For example, Tonewood in Waitsfield Vermont, offers a variety of maple products in elegant packaging. Their Maple Cube is solid maple syrup pressed into a sugar cube. You shave off a little to serve with cheese and crackers or put a little over ice cream. 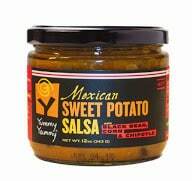 Yummy Yammy, a Vermont-based line of Mexican, Tuscan, and Moroccan sweet potato salsas, is another favorite. 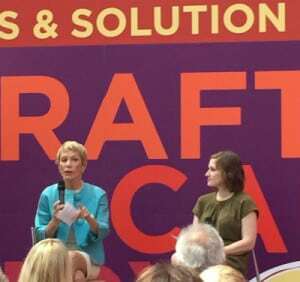 Shark Tank’s Barbara Corcoran spoke at the Fancy Food Show. The Nielsen Company is constantly conducting global research on trends in food, behavior, social media, and more. ProChef SmartBrief, published by the other CIA, the Culinary Institute of America, picks up articles about food and restaurant trends from many sources. Food Tech Connect covers news and trends in food and technology. Trendwatching.com analyzes trends in brands, consumer behavior, and business and innovation. Food Navigator USA tracks food, beverage, and nutrition. The Garden Media Group publishes an annual Garden Trends Report. Visiting other cities—especially trendsetting cities like New York, San Francisco, Los Angeles, and Chicago—is a great way to see what entrepreneurs are doing in other places. For example, when we visited San Francisco last December, my jaw dropped when my sister-in-law Audrey took us to a café called The Mill that specializes in $4 artisanal toast. I just couldn’t bring myself to try it; you can buy an entire loaf of bread for $4. While, thankfully, this trend has yet to become the toast of the town in Boston, I won’t be surprised when if it catches on.